Oak Valley Retreat is at Upper Kyongsa 1 km,vip shortcut to Pelling,is in Geyzing of West Sikkim.The capital city of the West Sikkim District, Geyzing is located at an altitude of 6,500 feet above the sea level with lofty and majestic mountains of the Himalayan range surrounding the city. The river Rangeet surges in the western part of the city. Keeping aside the scenic beauty of the nature that can be seen in this city; the many monasteries situated here make it a major tourist attraction. Geyzing is one of the major towns in West District of Sikkim as well as the district headquarter. 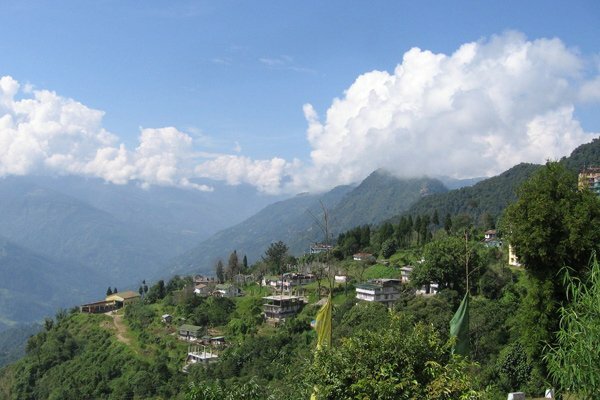 The town is also famous as Gyalshing among the local people and is located at a distance of 10km from Pelling. With the increase in the number of tourists travelling here every year, Geyzing has become a tourist hotspot and it is the main trading and commercial town of this region too. Geyzing, West Sikkim: The capital city of the West Sikkim District, Geyzing is located at an altitude of 6,500 feet above the sea level with lofty and majestic mountains of the Himalayan range surrounding the city. The river Rangeet surges in the western part of the city. Keeping aside the scenic beauty of the nature that can be seen in this city; the many monasteries situated here make it a major tourist attraction. Geyzing is one of the major towns in West District of Sikkim as well as the district headquarter. The town is also famous as Gyalshing among the local people and is located at a distance of 10km from Pelling. With the increase in the number of tourists travelling here every year, Geyzing has become a tourist hotspot and it is the main trading and commercial town of this region too. Yangtey, a hilltop which is a few kms away from here, is sited on top of a cliff and offers a beautiful scenic view. Straight down is the river Rangeet and up ahead you can see the marvelous Kanchenjunga Mountains. Apart from its natural picturesque beauty, this hill station is also famous for the monasteries which are visited by several Buddhist pilgrims. Pemayangtse Monastery, situated at a distance of 6 km from the region, is a beautiful monastery and one of the major tourist attractions of Geyzing. Travellers who visit this monastery can also see the ruins of the first palace of the Chogyal Kingdom. Another major attraction of Geyzing is Pelling where tourists can catch glimpses of many peaks which include Koktang, Rathong, Kabru, Kumbhakarna, Shimbho, Kanchenjunga, Pandim, Narsing and Siniyalchu.Kyongsa is in Geyzing.It is a nice place of West Sikkim. UPPER GYALSHING Village KYONGSA Panchayat GYALSHING is situated in West Sikkim - Geyzing District. People of this village are living in very peaceful manner. This village having very proud history. Agriculture is the main profession of this village. Still this village is waiting for Industrial development. Education, Drinking water, Road and Electricity are the main concern of this village. Young generation is more attracted towards mobile, Laptop and computer technology these days. If banks and finance institutions proved loan and other financial support to the villagers, this village will see the real development. Medical and health services has to be improved. If you wish to explore this divine place, you must have a bit of knowledge about how to reach this spot. Geyzing being a totally admirable tourist destination is well connected by rail, road and air networks. The most feasible and quick way to reach this spot would be by air. Bagdogra and Siliguri Airport are the closest to Geyzing and have frequent flights operating to and fro major states across the country. After deboarding at any of the above two airports, one can take a taxi to reach Geyzing. Ones, who are eager to experience a train journey, must know that New Jalpaiguri is the nearest railhead to Geyzing. Travelers can also take a train to Siliguri railway station, in order to reach Geyzing. These stations are well-connected with key cities across the country. A good number of local and express trains halt at these stations. So opting for a train journey, will also be a great choice to make. Visitors who are keen in taking the roads, can board a bus to reach Geyzing. Buses are available from places like Gangtok, Pelling, Jorethang, Yuksom, Darjeeling, Tashiding and Siliguri to reach this small yet captivating locale. Geyzing has a well-knit road network, making road travel easy for avid travelers. Travelers who wish to journey by air must know that Bagdogra Airport and Siliguri Airport are the ones which are situated the nearest to Geyzing. One can get down at either of the two airports and can further hire a private vehicle or a taxi to reach Geyzing. There are several flights running from both Bagdogra and Siliguri Airport, connecting major cities across India.